Hartford, Conn., Apr. 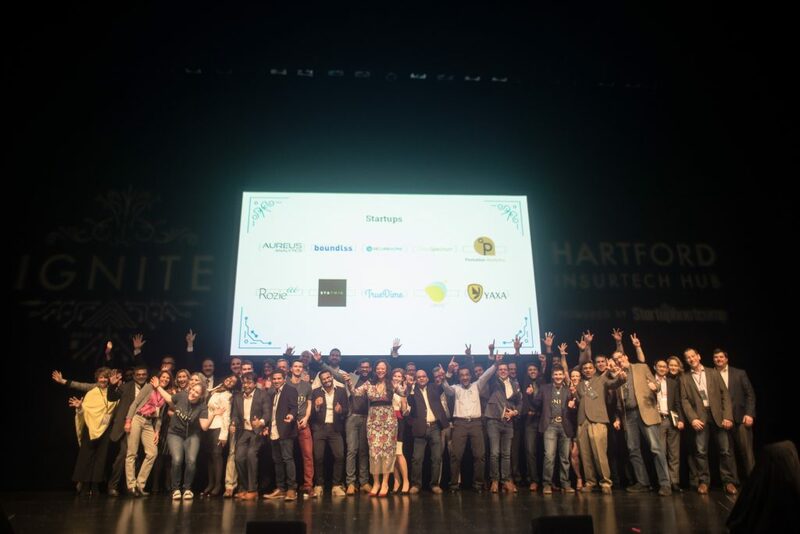 19, 2018 – The InsurTech Accelerator, part of Hartford InsurTech Hub powered by Startupbootcamp InsurTech, yesterday hosted its first Demo Day at The Bushnell Theatre, in Hartford, Connecticut. Out of the 10 startups graduating from the cohort, 5 startups have already secured pilots with leading insurance companies within the core sponsoring partners: Cigna, The Hartford, The Travelers Companies, Inc., Crawford & Company, USAA, and White Mountains. The 10 startups that took to the stage showcased technologies applicable to the health, life and property and casualty insurance industries, with propositions ranging from improving customer engagement, supply chain management, digital health and smart home solutions, among others. In addition to the pilots and partnerships secured, three startups have committed to opening an office in Hartford, as a result of the success they have seen during the InsurTech program. Aureus Analytics, a customer intelligence and experience company, has secured pilots with several insurers including partners on the program. Boundlss, helps health & life insurers attract, reward & retain healthy members, has completed a pilot with a leading US insurance provider. Rozie AI, an AI platform to design personalized customer engagement and robust business intelligence solutions for enterprises, has completed a proof of concept; is working to explore a pilot with a US insurer, and is exploring opportunities within a claims organization. SecureHome, a smart home IoT solution that provides critical security needed for every smart home, is running 3 pilots with insurance companies that are core program partners. ViewSpection, an app and web platform that enables a policyholder to do their own property inspection, has secured more than 10 pilots with insurance companies or companies related to their business, including program partners. As well as securing pilots with the InsurTech Accelerator’s corporate partners, the startups have also been highly engaged with the local Hartford and Connecticut communities. Several startups in the cohort have hired students from the University of Connecticut as interns throughout the program; local universities have established specific InsurTech courses as a result of interaction with the accelerator program; and two startups have run hackathons in collaboration with the University of Connecticut. Aureus Analytics, from India, is a customer intelligence and experience company that enables insurance carriers, brokers, and MGAs to deliver superior customer experience, leading to greater retention, loyalty, and lifetime value. Aureus does this using predictive analytics and machine learning to deliver insights in simple English at the point of decision. Boundlss, from Australia, helps health & life insurers attract, reward & retain healthy members, and understand & improve member health. Boundlss AI health assistant & conversational platform helps insurers deliver highly engaging, scalable preventative health, sales & claims conversations. Pentation Analytics, from India, is a Big Data Analytics company that enables insurers and intermediaries to better engage with policyholders. Pentation’s Insurance Analytics Suite provides predictive intelligence and process automation tools addressing the core insurance use-cases of increasing retention, cross-sales and optimizing claims. Rozie AI, from the United States, offers an AI platform to design personalized customer engagement and robust business intelligence solutions for enterprises. The emphasis on design and operations facilitates time to value, enabling Rozie AI to deliver technology that is easy to adopt and integrate into existing processes. Rozie AI takes a partnership engagement approach with clients to build a joint vision, to continually optimize business operations and deliver aggregate intelligence. SecureHome, from the United States, is a smart home IoT solution that provides critical security needed for every smart home. SecureHome’s technology provides protection against cyber criminals attacking smart homes and small offices. With SecureHome, insurers can launch new personal lines of business for cyber protection, proactively manage their payout risks for property and casualty policies and collect key smart home data while delivering value to consumers very early in the customer acquisition cycle. StaTwig, from Singapore, employs blockchain and IoT technology to provide real-time, tamper-proof, end-to-end tracking that identifies problems and inefficiencies in any supply chain. TrueDime, from the United States, provides self-employed individuals – including freelancers, sole proprietorships and small business owners – with a benefits platform that meets their unique needs. Ubios, from Canada, helps residential multi-tenant buildings prevent water leaks & lower their energy costs. Ubios’ solution integrates IoT with AI to automate a building’s water security and energy usage. ViewSpection, from the United States, is an app and web platform that enables a policyholder to do their own property inspection, and that delivers a detailed, interior property survey to an Agent or Carrier within days compared to weeks with the traditional loss control inspection model. Beyond delivering a faster, more cost-effective inspection report, ViewSpection creates a deeper connection between the carrier, agent and the policyholder, involving them in the a process and removing friction. Yaxa, from the United States, provides a real-time risk monitoring and threat remediation platform for enterprises seeking to actively detect and block malicious behavior. Yaxa provides protection against user behavior driven threats – understanding the individual user’s normal data access patterns (file activities, login time, database, ssh, web apps etc.) and taking automatic action when users deviate from past patterns. Yaxa follows the concept – “trust but verify”. For more information about the event and to keep up to date with Hartford InsurTech Hub and the InsurTech Accelerator, visit: https://hartfordinsurtechhub.com/ or follow on Twitter and LinkedIn. What is an InsurTech Demo Day?